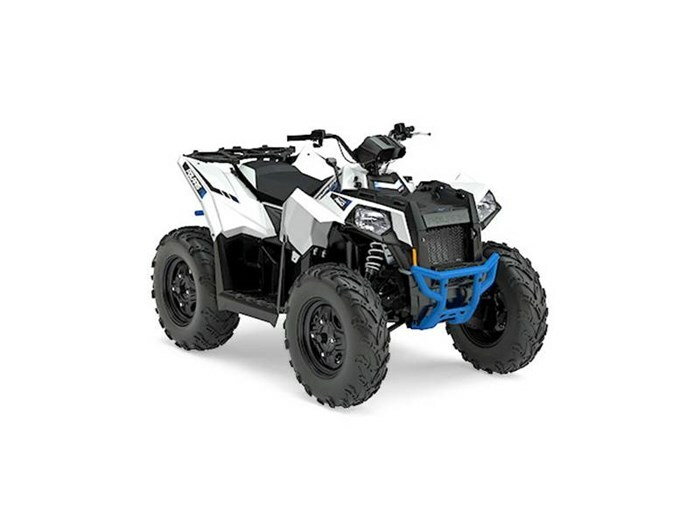 Packed with race proven sport performance features Class leading 78 horsepower ProStar® 850 twin EFI engine On-demand true All-Wheel Drive (AWD) Standard Features Race Proven Scrambler® ATVs are race proven both on the trail and in the desert. Team UXC Racing’s success on the vehicles include finishing the Baja 1000 and many GNCC podiums showing the true power and durability of the Scrambler. Class Leading 78 Horsepower ProStar® 850 Twin EFI Engine The High-Output 850 Twin EFI engine with a SOHC cranks out 78 horsepower. It delivers outstanding acceleration off the line with incredible power to the ground. Add-in a clean fuel burn and smooth power delivery with dual-balanced shafts and you’ve got the power you're looking for to trail ride and hunt. On-Demand True All-Wheel Drive Still the best automatic 4x4 system out there, the AWD engages all four tires when the rear wheels slip and you need more forward traction and automatically reverts back to 2-wheel drive when you don’t. Lock & Ride® Cargo Racks You have gear that you need to bring with you on a full day of riding and the Scrambler answers the call with two highly functional racks (front and rear) for 75 pounds total capacity. Sport Tuned Rolled Independent Rear Suspension Rolled Independent Rear Suspension (IRS) angles the shocks rearward for 10.25 inches of travel leading to a smoother ride and less squat during acceleration. Class Leading Ground Clearance With 11.5 inches of ground clearance, clear bigger rocks, navigate deeper ruts, and go where other ATVs can't.